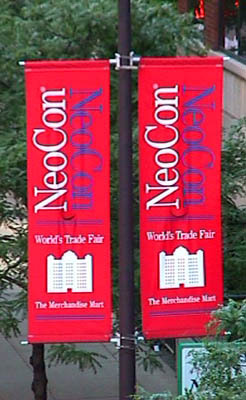 Bright red banners all over the Merchandise Mart neighborhood proclaimed that NeoCon 99, The World's Trade Fair, was at the Merchandise Mart! While NeoCon 99, an Office Products and Contract Furniture show, is not the typical show we cover, there were many pieces of technology scattered around the show floor. Here is some of the new, unique technology and products we found. All the photographs in this article are clickable. Click on one to see a larger version of that photograph. While not a displayed product, this year's NeoCon had an Internet Cafe on the 8th floor where attendees could surf the Internet on one of the several PC computers that were provided. 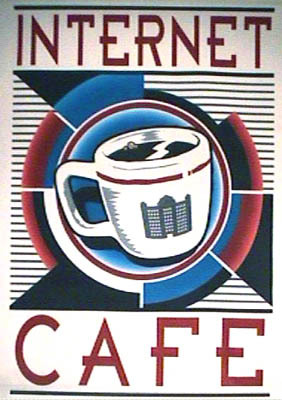 For people that had never used the Internet before, there was a quick tutorial program and cafe attendants, wearing "Ask Me About the Internet Cafe", that could help. It was very popular and most of the time people were waiting to use the computers. 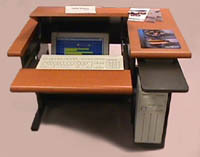 While this workstation can be used as a conventional 40" (101.6 cm) work surface for non-computer training, this model features a patented locking, flip-top mechanism that exposes an ergonomically positioned keyboard, mouse and monitor. 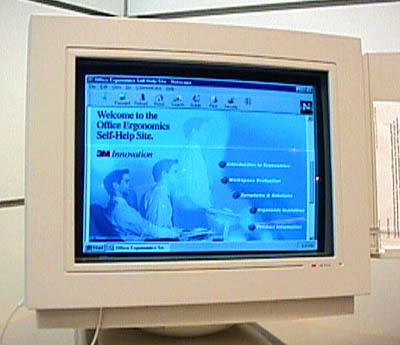 When the support shelf is pulled outward and pushed downward to the proper height, the desktop elevates to expose the monitor. This 8" (20.32 cm) support shelf provides comfort by supporting the forearm and provides ample area for a mouse, mouse pad and a writing surface. 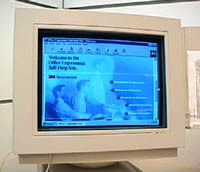 The monitor area is height, tilt and depth adjustable and this model can accept monitors up to 18" (45.72 cm) high and 18" (45.72 cm) deep (Most 17" (43.18 cm) diagonal CRT monitors.) Short tower CPUs up to 8 3/4 inches (22.225 cm) in width can also be accommodated. Retail price $1,100 US - Available from Vertiflex - Chicago, Illinois. This new 3M Anti-Glare filter reduces both glare and 99.9 percent of the ELF radiation from the monitor. Although this unit looks like the conventional monitor "filter", when I tried it here at NeoCon 99, it really did eliminate most of the glare from very strong show spotlights behind me. I was impressed! Available from 3M Corporation - St. Paul, Minnesota. The "cubicle" office environment fosters great intercommunication, but how do you tell others to stay away or interrupt me only when necessary? Use Protoblocs! These unique, stacking, brightly colored objects are the newest office productivity tool. They help empower workers to be able to silently communicate their current "interruption status". 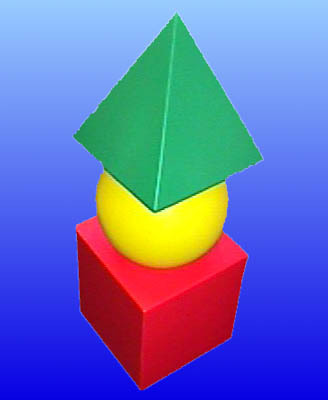 The GREEN pyramid signals that the worker can be interrupted or that the work going on is collaborative. Participation is invited. The YELLOW sphere alerts others to exercise caution and to disturb only if necessary. The RED cube stops interruptions like a closed door and alerts other not to disturb under any circumstances. Now if you can only get your boss to obey these signals, you might get some work done. Retail price $14.95 US. Available from Protoblocs - Washington D.C. The Leica Dista Pro is a unique, laser based distance measuring device. By incorporating a laser in the device, you can easily see where you are measuring and because the laser beam is so small, you can get better measurement of uneven surfaces (like trade show ceilings). With competitive devices, based on sonic technology, you can't see what you are measuring to and if the surface is uneven you can't pinpoint the exact dimension you want. This model can measure from one foot (0.3 m) to over 330 feet (100 m) to the accuracy of 0.06 inch (1.5mm). Wow, you can now measure a football field to the accuracy of a sixteenth of an inch (1.5 mm)! The Pro version of the Dista product line is also capable of storing 1,000 measurements, performing mathematical calculations and even has an RS-232 computer port to connect to an portable or other computer. It runs on 4 AA batteries, weighs 1.4 pounds (670 g), is rainproof and operates in temperatures from 14 to 122 degrees Fahrenheit (-10 to 50 degrees Celsius). Available from Leica Geosystems Inc.
Getting the proper office configuration isn't easy. 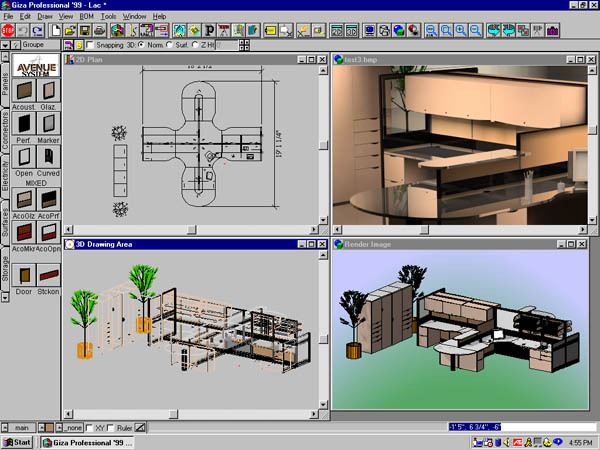 While layout out the furniture is easy to do with a product like Visio, people have to read a blueprint to see what the area will look like. Well, Facet, Inc. has changed that - their software package is not only capable of creating the furniture layout and the total cost, but it can create a near photographic rendition of what the office space will look like (complete with reflections and texture mapping). Since this 3D rendering takes awhile, the program can provide a real time wire frame and solid color 3D model of office space being designed. From all the products we saw at the show, this software seemed to be the most impressive because it allowed a designer to show a near photographic picture of what the space will look like - no surprises. 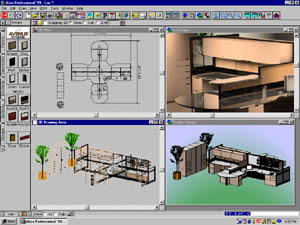 The software has product information and furniture models from 100 different manufacturers. It runs on Windows 95/98 and NT. Retail price ranges from $200 to $1,495 US. Available from Facet (Giza), Brossard, Quebec, Canada. Dynasound makes the world's largest line of sound masking systems and equipment. 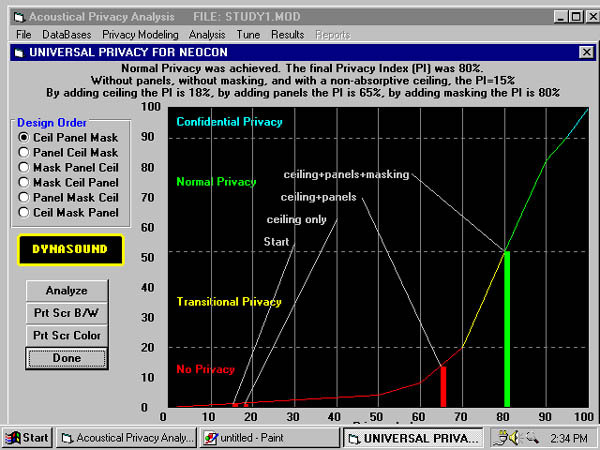 CAAD (Computer Aided Acoustical Design) 2.3 helps users evaluate the combined effect of furniture, panel heights and ceilings on "acoustical" privacy (simply stated, the ability or inability to hear the conversation in your neighbor's cubicle). 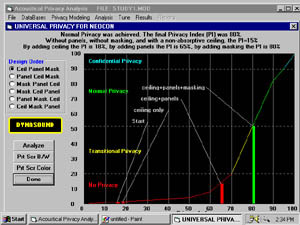 The screen shot graph shows that by using electronic sound masking technology, normal privacy can be achieved. Yes, Dynasound makes products that defeat listening devices in walls, doors and even windows (the glass kind). 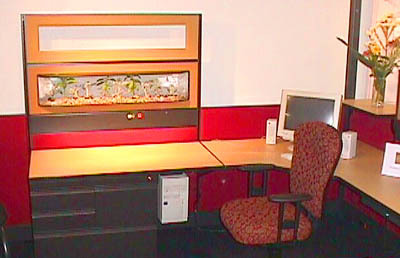 Many companies make office furniture. What impressed me about ESFI (Enviro Systems Furniture Inc.) was their commitment to the environment. They have created a committee named OWNER (0 (Zero) Waste None Everyone's Responsibility) and have saved 500 thousand dollars in 1998. But more than that they use 100% recycled yarns for their fabric selections which saves 2.2 pounds (1 kg) of dyes and chemicals, 1.5 pounds of packaging material, 500 thousand BTUs of energy to process the fiber into fabric, 248 gallons of water, 50 pounds of carbon dioxide emissions and most importantly 1.7 pounds of solid waste destined for a landfill. It looks like ESFI has made great strides by eliminating this waste that could have been on Earth, in some landfill, for hundreds of millennia. ESFI has a non-obsolescence policy which keeps their clients from having to buy new advanced products. By upgrading new technologies into existing products, they eliminate waste at the source by allowing communications or power upgrades to furniture that is not worn out.